Pop Culture Safari! 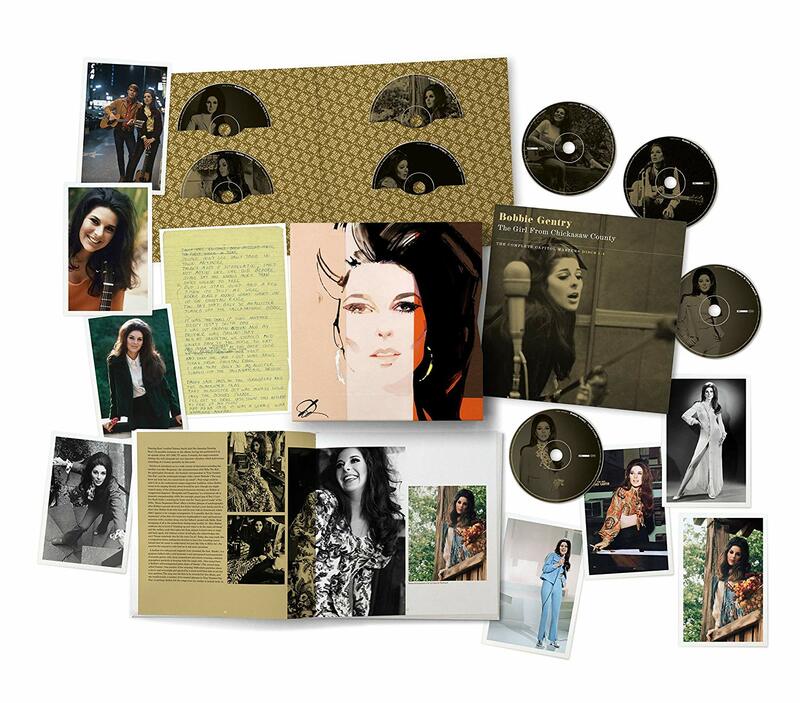 : Coming Up: Bobbie Gentry "The Girl From Chickasaw County - The Complete Capitol Masters"
Coming Up: Bobbie Gentry "The Girl From Chickasaw County - The Complete Capitol Masters"
Out Sept. 21. Pre-order from Amazon now. In 1967, an enigmatic singer, songwriter and producer, named Bobbie Gentry rose out of the Mississippi delta and enchanted audiences around the world with her beautiful, captivating voice and her “Ode To Billie Joe.” An unconventional, beguiling song with simple acoustic guitar and sparse production, and notably without a discernible chorus, the song introduced Gentry and her style of storytelling that was very different to the confessional song writing of other emerging female singers. The song caused a lot of commotion as it shot to number one in America and knocked The Beatles’ “All You Need Is Love” off the top spot. When the album Ode To Billie Joe was released the following month, it topped the charts and was the only record to displace Sgt. Pepper’s Lonely Hearts Club Band from its 15-week reign. Over the next several years, Gentry, whose birthday was this past Friday, July 27, released seven studio albums and broke ground in numerous ways as one of the first female musicians to write, produce and even publish her own music. She also produced her elaborate stage shows via her own production company and was the first female singer songwriter to be afforded her own BBC TV series in the UK where she was wildly popular. She became one of the most iconic and influential artists of the 1960s and 70s and then in the early ‘80s she made her final appearance and disappeared from the public eye completely, never to return. Capitol/UMe are proud to announce that on September 21, they will release the first major retrospective of this most groundbreaking artist with The Girl From Chickasaw County – The Complete Capitol Masters, an eight CD box set that includes all seven of Gentry’s studio albums sensitively remastered from the original tapes, supplemented by over 75 previously unreleased recordings including her ‘lost’ jazz album, outtakes, demos, rarities and an eighth disc of live performances taken from her celebrated series for the BBC. The release has specially commissioned cover art by David Downton and includes an 84-page book with a comprehensive essay by boxset compiler Andrew Batt, rare and unseen photos, eight postcards and a facsimile of her original handwritten lyrics for “Ode To Billie Joe." Gentry’s career blazed brightly for a few short years, but only now is the full extent of her artistry coming into focus. When we think of empowered female stars we think of Beyoncé, Madonna, or even Dolly Parton, but before all of them there came the girl from Chickasaw County. When she emerged in the late 60’s women were just starting to make their mark in the music industry, but female identity was polarized between the light entertainment star and the confessional singer-songwriter. Gentry developed her own unique persona, which was a hybrid of both; part creative songwriter, and part musical theatre performer. A storyteller at heart, Gentry created characters and situations that were often inspired by her Southern childhood, and the media and public alike were fascinated by the contrast between her glamorous appearance and the rural simplicity of her origins. Romanticized over time, these stories have coalesced into a classic version of the American dream; a rags-to-riches story that took Gentry from the Delta backwoods to the world’s most glittering stages. Her disappearance intrigues us quite as much as what was thrown from the Tallahatchie Bridge: Why did she disappear? What has she been doing? Where is she now? But ‘Where is Bobbie Gentry?’ is not the question we should be asking: Gentry was a trailblazer who was years ahead of her time; a successful writer, singer, musician, performer, producer, publisher, and businesswoman. What we should really be asking ourselves is ‘Who was Bobbie Gentry?’ - The Girl From Chickasaw County provides more answers to that question than ever before, definitively re-appraising the musical legacy of this influential and iconic artist.